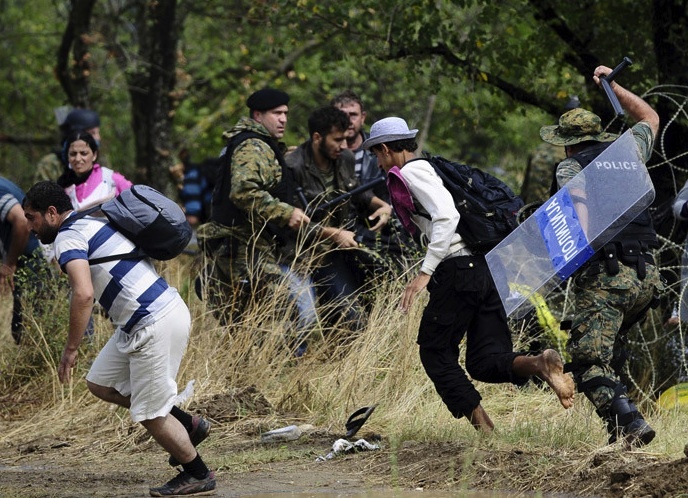 Muslims from Syria removed the border fence between Greece and Macedonia, and made their move westwards. Skopje has declared a state of emergency. The Maccedonian border police lost the control of their borders, at the hand of Syrians. Alarmed at the flow of migrants coming in through Greece, the tiny European nation of Macedonia declared a state of emergency Thursday. It has begun deploying riot police in armored vehicles and calling in the military. The borders of Maccedonia has been opned by immigrants from Syria. An emergency has been decleared. The Associated Press reports Macedonian officials have blocked thousands of migrants from entering and left them stranded in an open field being described as a “no-man’s land” near the Greek border. The borders of Europe are under pressure from mass immigration of Muslims. 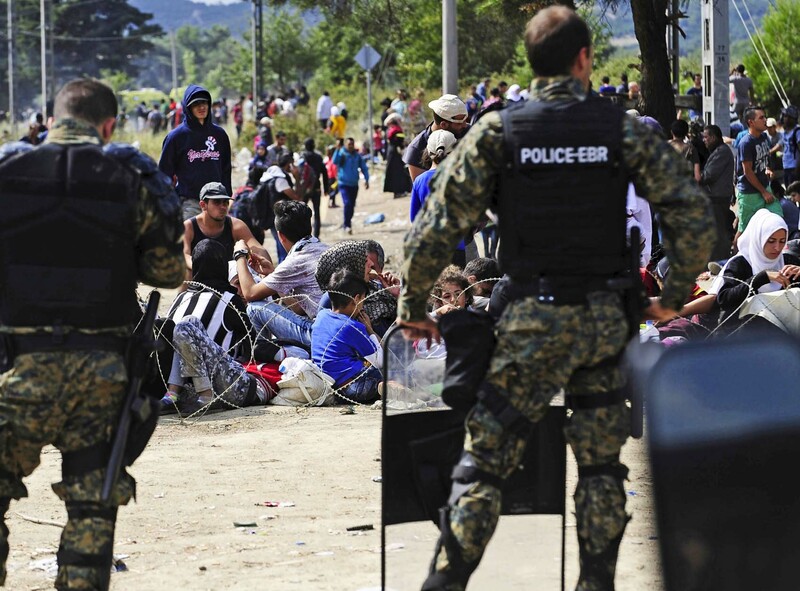 “The government said it was proclaiming a state of emergency on its borders and deploying army troops as it tries to stem a surge of migrants from the Middle East, Asia and Africa that has overwhelmed the economically impoverished Balkan country,” according to the AP. 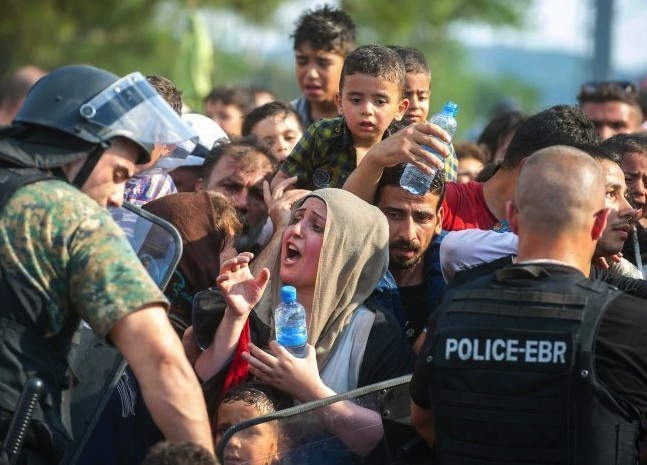 The Guardian reports that as many as 2,000 migrants a day have been pouring into the Macedonian town of Gevgelija. The Balkans often became a battlefield for freedom fighters in Europe. After the fall of Constantinople in 1453 A.D, the Ottoman Turks raised their ambitions. They advanced westwards in a bid to capture the kingdoms of central Europe. The advance of the forces of Islam were stopped at the gates if Vienna in 1529. A.D. But the defeated Muslims were never forced out of the Balkans. In places like Bosnia, Kosovo and Albania, their influence are still felt. 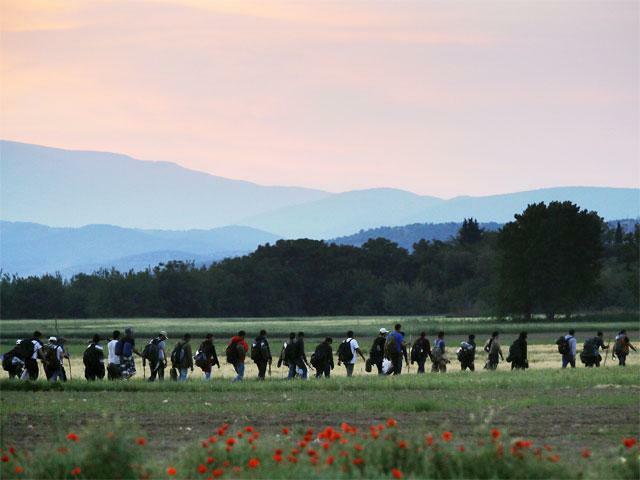 When the Muslim flee Syria, they do not aim for the Muslim enclaves in Europe. They do not desire to settle in Bosnia, nor in Kosovo. They do not apply for working visas in Albania. They are on their way to Paris, Amsterdam and London. Because, there is where the cash is. They have been told, that they can expect to be protected by social security laws. You will hear of wars and rumours of wars, but see to it that you are not alarmed. Such things must happen, but the end is still to come. For then there will be great distress, unequalled from the beginning of the world until now – and never to be equalled again. Among the hordes from the east, there are thousands of innocent civilians. They only want to escape from the horrors of the Islamic civil war. But they are puppets in the hands of the forces of Jihad. The Islamic terrorists have found a way to enter Europe without a visa. Just look miserable, and push some crying children ahead of you. 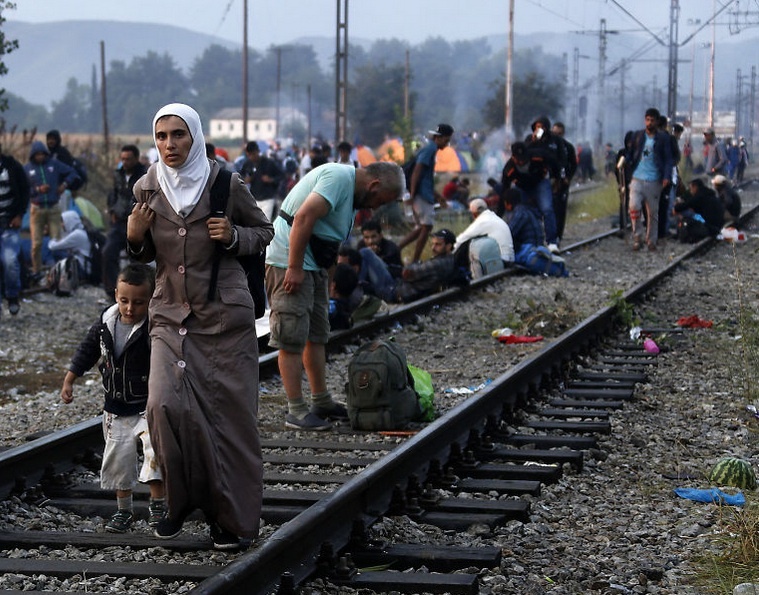 Desprate Muslims are trying to get across and into the Balkans. It is difficult to number the desperate people waiting for the next train. The Syrians will try to reach Western Europe using bikes. There seems to be Syrians everywere along the highways. There are no proper shelters. 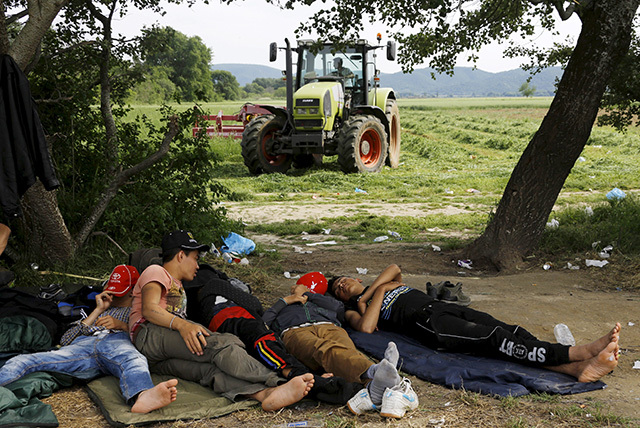 Rest and sleep takes place in the fields. Will this Muslim woman be able to make it to Paris or London? They come from the East, and they will not return. Jesus the Messiah did not particularly warn us about unlimited Muslim cynicism, who take advantage of limitless secular naivety. But the Messiah warned us about distress unequal to what we have seen since the creation, just before His second comming. As we watch the illegal immigrants fighting the border police in Macedonia, we see the fruits of lawlessness, panic and chaos. Be ready for a rocky ride, till we see the Messiah returning in the clouds of Heaven, in all his glory. Amen. Hello, I have been reading your comments for over a year now and sometimes I would like to post them on Facebook or Pinterest, to let others see. I’m not sure what you would have to do on your website to allow this but it would be appreciated if you could set something up. Thank you for your ministry! You can make a link on your facebook to every article on News That Matters you desire. Jeremiah 51:14, G-d says I will fill thee with men like locaust , and they will raise a battle cry against thee..
Jeremiah 51 is about the destruction of ancient Babylon. No words about the nuclear reactors of Iran. ‘Before your eyes I will repay Babylon and all who live in Babylonia for all the wrong they have done in Zion,’ declares the Lord. May it be recalled that the Babylonians destroyed the first temple in Jerusalem, and completely ruined Zion. And that ancient Babylon seized to exist. That the Jews will run to Petra, is another phantom revelation with no base in the Bible. I have been in Petra, and I have read the Bible. So I am able to debate this topic. It might do you well to read the historian Josephus. He lived and wrote history of Israel and the land. You are wrongly applying the prophecy of Zecariah 14 to the days of Josepheus, and the destruction of Jerusalem in 70.A.D. Surely there were horrible crimes committed when about one million Jews were slaughtered by the Romans. And I am sure Josepehus has given a trustworthy account about these horrors. I also have read his account. An important event has to take place first, before Zecariah 14 is fullfiled. The Messiah must return. In Zecariah 14, the Messiah is dealing with his enemis among the nations, all of them in fact. Because they attack His nation, and the people He has restored in Zion. The eyes of the anti-Zionists will surley root in their sockets. Based on what I am seeing through the various news agencies and what I have read in the Bible (deep study for over 10 years now) I believe the beginning of the Great Tribulation is upon us. Blessed are those that have repented and surrendered to YHVH and placed their hope in Yeshua. I have been of the opinion, that we have been inside the Great Tribulation for some time. I can not pinpoint an exact date for when the age of mercy was over, but surely jugdment has come upon the Earth. And since people will be saved, even inside the Great Tribulation, both mercy and the acts of the Holy Spirit will be there. I do not belive there will be an exact date for the end of the age, but the global population slowly being stricken by panic. In large parts of the World, there are now apocalyptic violence and opression. And no place on the face of the Earth will escape. Only those who have surrendered to the true Messiah, will live in peace, in the midts of horror. Simply because our life in the flesh on Earth, is not the purpose of our faith. Only the true followers of the Messiah, will not accept the rule of the last and final antichrist. One of the sign of the end of the age of grace, is people not responding to truth, but a widespread desire to accept false Christs and the prosperity gospel. The pre-tribbers are now mostly silent, because their Jesuit-inspired theology do not fit into the reality on the ground. We know that there will be a day when the full numbers of gentiles have come into the Kingdom. We seems to have reached the area of the ultimate limit. Peace to you and your readers. The Lord Jesus was asked about the signs to look for. Of the time we are currently in, He said ‘the end is not yet’. There is a sign to look for that will clearly define that the time for the great tribulation to start, that sign has not yet appeared. It appears in Daniel. That book he wrote that was not for his time, but for ours. No one has yet signed the peace covenant. Those who read that book and can identify correctly who is who will know who to watch. Some are saying tony Blair might be an envoy for one of the characters with his scurrying around trying to secure peace. He may well be a character to watch as some involved at the end will not be heads of state till late in the series of events, and when they do become heads of state they will hand over authority to the king of the north. One thing for certain, the king of the north is not russia. We are still in the beginning of sorrows, things will get much worse. God watch over His people. Amen. Plese give me the scriptures you have used to come to such a conclusion. You ask a fair question. I have never been given scriptures to support the belief that Russia could be the king of the north. Lets look for ‘beasts’ in the Bible. 4 The first was like a lion and had eagles’ wings. Then as I looked its wings were plucked off, and it was lifted up from the ground and made to stand on two feet like a man, and the mind of a man was given to it. 6 After this I looked, and behold, another, like a leopard, with four wings of a bird on its back. And the beast had four heads, and dominion was given to it. 7 After this I saw in the night visions, and behold, a fourth beast, terrifying and dreadful and exceedingly strong. It had great iron teeth; it devoured and broke in pieces and stamped what was left with its feet. It was different from all the beasts that were before it, and it had ten horns. 8 I considered the horns, and behold, there came up among them another horn, a little one, before which three of the first horns were plucked up by the roots. And behold, in this horn were eyes like the eyes of a man, and a mouth speaking great things. This is the story of an empire based around the Mediterranean. Some people think that because verse 5 says ‘like a bear’ and because Russia has been referred to as a ‘bear’ this verse refers to Russia. The nation that rose up ‘like’ a bear, may have behaved ‘like’ Russia’ but wasn’t Russia. ‘Beasts’ however are empirical states that rise up, but, there are gaps in between, they do not rise up one after the other. Look again at Daniel and he mentions ‘horns’ these are men or women who become heads of governments. All the action takes place closer to the promised land and nations who are strong cannot surprise the world like a weak Europe suddenly becoming a world power. Russia is mighty now. Nothing to surprise us with.